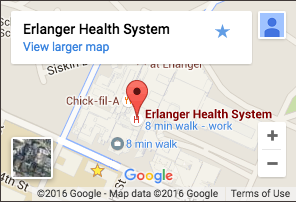 Erlanger Health System staffs seven Emergency Departments that serve children and adults in the East Tennessee and Western North Carolina region. Depending on you or your loved one's condition, an urgent care facility might be more appropriate than going to an emergency room. If you think you are are having a medical emergency, call 9-1-1 immediately. Short-term parking is available for emergency patients who are able to drive themselves or for persons who accompany them. The Pediatric Trauma Team, Emergency Department, and Pediatric Intensive Care Unit provide immediate, 24-hour-a-day care for critically ill or injured children. Erlanger LifeForce Air Ambulance and the Neonatal/Pediatric Ground Transport make the services of Children's Hospital quickly accessible to pediatric patients throughout our region. Open 24/7, with private trauma room.